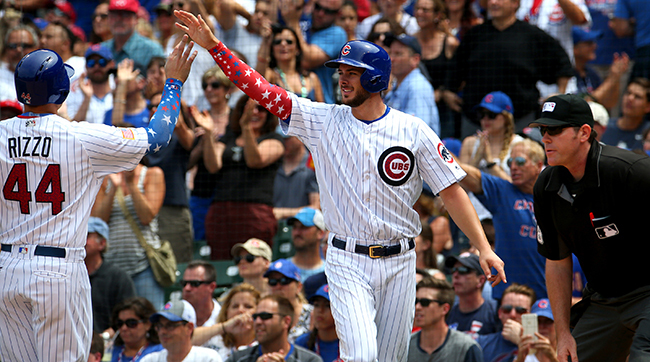 When the MLB All-Star Game starters were announced last night, the Chicago Cubs became the first team in 40 years to have five position players selected. They also became just the second team ever to have their entire infield picked to start, a group that includes 1B Anthony Rizzo, 2B Ben Zobrist, 3B Kris Bryant, and SS Addison Russell. The fifth Cubs starter is OF Dexter Fowler. Federer is 17-8 in Grand Slam finals, including 7-2 at Wimbledon. Federer hadn't advanced past the quarterfinals at a major before it all came together at Wimbledon in 2003. Seeded fourth, the 20-year-old Federer defeated Mark Philippoussis in straight sets in the final to become the first Swiss man to win a Grand Slam title. Federer clinched the No. 1 spot in the rankings with his semifinal victory against Juan Carlos Ferrero. He then coasted in the final against the unseeded Marat Safin, who had beaten top-seeded Andy Roddick in the quarterfinals and Andre Agassi in the semifinals. In a matchup of the two top-ranked players, Federer defeated Andy Roddick 4-6, 7-5, 7-6 (3), 6-4 to win his second Wimbledon title in a row. Federer improved to 6-1 against Roddick. By routing Lleyton Hewitt in the final, Federer added the U.S. Open to his Wimbledon and Australian Open titles to become the first player since Mats Wilander in 1988 to win three majors in a year. Calling his play in the final "the best in my life," Federer picked apart Andy Roddick 6-2, 7-6 (7-2), 6-4 for his third consecutive Wimbledon title. Federer lost one set in the tournament, to Nicolas Kiefer in the third round. Deadlocked at a set apiece and down a third-set break against 35-year-old Andre Agassi, Federer rallied to win the final in four sets. Federer claimed his sixth major and became the first man in 68 years to win Wimbledon and the U.S. Open in back-to-back years. "The standard and the options and the talent and the execution that he shows in all the biggest matches -- it's crazy," Agassi said after being denied a ninth Grand Slam title. The 24-year-old Federer tied Mats Wilander and John McEnroe with his seventh major title, defeating Marcos Baghdatis in the final. Federer had been 1-6 lifetime against Rafael Nadal, including a loss in the 2006 French Open final, before subduing the Spaniard for his fourth Wimbledon championship in a row. But in pushing Federer to four sets in the final, Nadal served notice that he was more than just a clay-court wizard. With yet another victory against Andy Roddick, Federer won his third U.S. Open in a row and capped another year with three major titles. Federer won his 10th major in dominant fashion: He didn't drop a set in Melbourne, handling Tommy Robredo in the quarterfinals, Andy Roddick in the semifinals and Fernando Gonzalez in the final. Federer matched Bjorn Borg with both his five consecutive Wimbledon title and 11th major overall after edging three-time French Open champion Nadal 7-6 (7), 4-6, 7-6 (3), 2-6, 6-2, the Swiss star's 54th victory in a row on grass. Novak Djokovic squandered seven set points in the final against Federer, who prevailed 7-6 (4), 7-6 (2), 6-4 to become the first player in the Open era (since 1968) to win four straight U.S. Open titles. Federer entered the U.S. Open near the end of a down year by his lofty standards: After a bout with mononucleosis, he had failed to win a Grand Slam title, had won only two minor titles and had ceded the No. 1 ranking to Rafael Nadal. But the No. 2 seed survived a five-setter against Igor Andreev in the fourth round and went on to stop Andy Murray in the final. With a victory against surprise finalist Robin Soderling (who had stunned Rafael Nadal in the fourth round), Federer won his first title at Roland Garros, tied Pete Sampras' record of 14 major championships and became the sixth man to complete the career Grand Slam. Federer moved ahead of Pete Sampras for most Grand Slam titles with his sixth victory at Wimbledon, which unfolded without injured defending champion Rafael Nadal. Federer outlasted Andy Roddick in a marathon match that went to 16-14 in the fifth set. Federer served 50 aces and overcame the resilient American 5-7, 7-6 (6), 7-6 (5), 3-6, 16-14. The 30 games in the fifth set established a record for the most games played in any set in a Wimbledon singles final. Playing in his 22nd Grand Slam final, Federer was in rare form, dropping fifth-seeded Andy Murray 6-3, 6-4, 7-6(11) at the Australian Open for Grand Slam title No. 16. The 30-year-old Federer finally equaled Pete Sampras' record at the All England Club, and won his 17th Grand Slam title overall, by beating Andy Murray 4-6, 7-5, 6-3, 6-4. Ray Allen's reps recently reached out to Warriors about possibility of Allen joining Golden State, per @Chris_Broussard. Come one, come all.